"I’ve now been broadcasting longer than I played and I feel like I’m just beginning to get it a little bit," said Fox NFL analyst Troy Aikman, who completes his 13th NFL season with Fox this Sunday in Seattle when he calls the NFC Championship (kickoff is 3:05 p.m. ET) alongside Joe Buck. “I’ve always known football. I’ve always known the quarterback position. I’ve always known offense and defense and all the things I’m being paid to talk about. But as far as the business called television, I’m just now seeing the improvements." How much do you currently enjoy broadcasting? I was a little down, to be honest, a little depressed. So we are sitting there having dinner, relaxing, and [ESPN’s] Ron Jaworski comes over. He was eating at the other side of the restaurant. So he says, "Hey, man, what a great game! How about that catch from [David] Tyree!" He’s all excited. I was like, “Yeah, it was good.” He is going on and on and then finally says, "What’s wrong?" I said, “Nothing is wrong.” He said, “Why aren’t you excited? You just called this great game.” I said, “Ron, I didn’t do anything. I’ve played in that game. I won that game. I know what that feels like. All I did was talk about it. I didn’t do anything.” And he walked away and when he did, he gave me this quizzical look. It was like, “What is wrong with this guy?" But I will tell you since that time I have not experienced that low again. We did the Super Bowl last year in New York and I could not have felt a greater accomplishment in this business. I don’t know why I am all of sudden getting real satisfaction out of this job, but I am and that has really helped me. The preparation is extensive and I put a lot of time into it, but I enjoy it. As a former player I have a real appreciation for a guy like Aaron Rodgers and how much time he puts into his craft and how good he is doing it. I enjoy the relationships I have with coaches and players. I enjoy the process of getting ready each week. I enjoy my crew. I like the weekends and being at the site of the games, and we get to do great games. I am so fortunate to have had a career like I had playing -- I lived my dream playing in the league -- and now to do a job where I get to be around the sport is beyond imagination. The only negative for me is I have my girls [he has two daughters, 12 and 13] and I am gone for six months out of the year. I miss a lot of their activities. I do get to see a lot of them during the week that a lot of dads don’t get to see and then I have six months where I am always there. But being gone on the weekends and missing some important moments in their life is really the only negative. How did this professional fog lift? And how long did it exist? You know, I don’t really have a great answer. I never felt it again. Of course it was three years until we did our next Super Bowl, which was the game in Dallas. But I didn’t feel that way after future playoff games. I have not experienced that feeling again and I’m not sure exactly why. I don’t want to say everything was fine the next season, but when we did our next really big game, I didn’t experience it. So because of that, I really have been able to enjoy the profession. "At the time this was happening, I’ll admit I was thinking everyone wants to take pride in what they do and feel satisfaction and I was thinking, Do I need to go into coaching or something else to experience the highs and lows of winning and losing? That for me is real. You love the winning when you were playing but you just miss having so much invested and then not knowing completely whether we got it done or did not get it done. That’s how I felt in 2008 but I have not felt that way since. Where are you right now contractually with Fox? I just wrapped up the last year of my contract. I think it’s clear they would like to continue with you and it’s likely the same on your end. Where are you in terms of an agreement heading forward? I would say that we have essentially agreed to terms. The contract has not been signed yet but I think it is a matter of just cleaning up a couple of things and then it will be signed. You’ve been a broadcaster since 2001. At what point does a sports broadcaster reach his or her apex and why? Good question. I feel that last year midseason is when the craft kind of clicked for me. I feel like I have been at my best since midseason last year. The one thing about being an athlete, say you are struggling with throwing a comeback route, well, then you go out and practice it. You throw it 100 times a day and you get better at it, and you see those improvements pretty rapidly. In this business, you don’t get the practice reps. You can’t work on it as much as you like to work on it. Your practice time is live. I find you have to do a lot of evaluating on your own. I’m asking myself, Why is this good? Why does this work? And not everyone agrees with that. We are in a business that does not give a lot of feedback and you just try to be a critic of yourself. Or you ask other people why something is good for them and try to incorporate it into what you are about but still remain authentic. People who work in regular jobs get quarterly reviews or end of the year evaluations. How does you get your work reviewed? Fox began a few years ago using an anonymous person to evaluate each broadcast. We also get a report each week -- things they liked, things they did not like, things they felt I could have added. Or this was a great anecdote, things like that. It is helpful. But the frustrating thing for this business, and I think everyone experiences it, I use the analogy that when I played, I would be watching a Monday Night game and if Joe Montana threw three interceptions, you would say, "OK, he had a tough day but he is still a helluva quarterback." In this business, it just seems like really more opinion than anything else. One is only as good as what people think. There is no real measuring stick as there is in athletics. That part of it is frustrating for all us who played competitively and then have gotten into television. But I receive critiques from my bosses each week and the weekly reports. So how do you view the Dez Bryant play now that a couple of days have passed? When it happened I did not think for a minute it was not a catch. When it happened, I’m thinking it is an unbelievable catch. Then when we went to break, [Fox rules analyst] Mike Pereira said he thought the call was going to be overruled. I said, “Really? It looks to me like if anything is changed to the call it will be ruled a touchdown.” They ruled it the way Mike saw it. I’m not going to argue with Mike. After the game you hear from all sorts of people about the call and 99 percent of my friends who texted me are just fans and most don’t know the rules. But I did hear from some coaches and that got my attention. And they felt it was a poor call. The question becomes about the whole football act and that’s why it ultimately was not a catch. If you said Dez made a football move, then it would have been down by contact. Since it was through the process of the catch when the ball was bobbled, then it was incomplete. I trust Mike Pereira and I trust the New York office had the ability to communicate with [referee Gene] Steratore. But I think in general there are way too many discrepancies in our rule book. I have felt for years they should blow the whole thing up and start over and make it simpler. What is a football act? There are just all kind of different exceptions and not just on catches but the rules in general. Something that’s interesting to me is that I believe Pereira frees up you and Joe not to have to get in-depth about rules decisions. I see that as a positive because broadcasters can get in trouble with rules-based stuff in any sport. But you might view it differently. Does Mike free you up, or do you still feel you have to get an evaluation in? I don’t feel he necessarily think he frees me up. I think he is great to have and I think everyone has seen the benefit of Fox having Mike Pereira on our network because now everyone has gone with someone like that. And it makes sense. It is great for the viewer. The rulebook is extensive. The league sends a video out every week to the broadcasters on all the various plays that happened the previous week and here is why it was ruled that way. You go back and forth on why things are being called the way they are being called. Mike and I have disagreed on calls. Go back to the NFC Championship Game [Jan. 2010] between the Vikings and Saints. Mike said a hit on Brett Favre should have been roughing the quarterback. I disagreed. I think when you have a call that helps determine the outcome of a game and you are able to go to the guy who was once the head of officiating, it is a great luxury for us to have. But that does not take away from what my job is. So I don’t know that it frees me up. I just think it is a great luxury for us at Fox. You are on social media but you are not very active. How much viewer criticism of your work do you see weekly? Quite a bit. I typically don’t read any mentions immediately after a game because that’s never good for anyone [laughs]. But I do read it and I keep it in its proper perspective. For the most part I find it entertaining. I have often said social media is a race to the bottom. But I understand that part of it. There are times when we all recognize when a person is right with something said on social media. Sometimes there are some positives that come out of it. So I do read it and follow it. I see a fair amount. Do negative comments ever impact your broadcast? It doesn’t impact me. It really doesn’t. I think it is because I was a quarterback for the Dallas Cowboys for 12 years. I have been in the middle of the storm. I have thrown game-losing interceptions and had to deal with that for a week. Whatever is said, such as people saying I am hating on some team, it has no relevance to me. As an athlete, you were trying to reach the top of your profession both individually and with the Cowboys. How important is it for you to be considered the top NFL analyst on television? Well, that is what you strive for, that is what I work toward. But I don’t know that you ultimately ever achieve it. Right. It’s like saying who is the greatest quarterback of all time? That's what great about sports. It is a great debate. No one has ever ultimately achieved that unanimously. So if a fair percentage of people regarded me as the best at what I do, that would be a great complement to me and that is what I strive for. Joe Buck is a strange case. He’s not a polarizing broadcaster with his content yet he draws emotion on both sides, especially from viewers who dislike his work. People always have a definitive opinion of him and, obviously, there are some fan bases that just don’t like him. Have you ever been able to figure out why a guy who is not provocative or a shock jock draws such strong opinions about him? Yeah, that is a very good question and I don’t know that I have a good answer for you. I have worked with Joe for 13 years and the guy is phenomenal. He is so good at what he does. He simply does not make mistakes and with all that is going on, he just handles everything so effortlessly. I think Joe’s style is that he wants to come across as very casual, but the amount of time that he puts in for preparation is off the charts. He is a play-by-play guy who is not interested in just blending in. He has opinions and he is going to give them and people are going to take notice of him during a broadcast, And that is great. Beyond that, people just like something or they do not. To me, I think it speaks to how great he is, that people immediately have a reaction to Joe Buck. But as far as people viewing him unfavorable because of something he might have said or challenging this particularly fan base, nothing could be further from the truth. He is a great guy, cordial to everyone he comes across. I don’t quite get it and I don't know if he is impacted by any of it. But there is no one I would rather be working alongside. You are a very young man in broadcasting at 48. When you project how long you want to stay in the business long-term, could you see yourself going deep into your 60s and 70s? What I believe is when my girls go off to college, which will be here before I know it, I think that is when this job will become even more fun than it is now because I won’t be racing back after games to see them before they go to bed on Sunday nights. I might be able to enjoy more some of the cities in which we travel. Having said that, I don’t see myself doing this into my 60s and certainly not my 70s, God willing. I’d say another 10 to 15 years or so. How would you view the Seahawks historically if they repeat as Super Bowl champions? If people want to use the word dynasty and then see where they rank historically with the Steelers, Niners and us, they are in that conversation. I think they would have to be considering that it’s a different time and we don’t see this now. I would certainly put them in that conversation. What they have done is really special and it does not surprise me where they are right now. I would expect them to be in the middle of it next year regardless of what happens against the Packers. How do you view the Cowboys' season? Here’s one view: The offensive line came together, Tony Romo had a great year, and this bodes well for the future. The other view: This was a really big shot for them, their quarterback is in his mid-30s, and they didn’t capitalize. I tend to look at it as more of the latter. It seems that Dez will be back, I’m not so sure about DeMarco Murray and Tony will be 35 next year. I know what that’s like. It was a challenge for him physically this year and he played great. So many things had to happen for them to have the kind of year they did this year. Not just for Dallas, for any team…The Cowboys have to prove for me that they can develop talent and do all the things that someone like Seattle has done. They were very healthy this year. There were teams I was on as a player that were very talented teams and for whatever reason they could not win the games they had to win to ultimately achieve what they wanted to do. This was an opportunity for a Dallas team that was playing as well as anyone in football and had as much confidence as anyone and they came up short. Does that mean they can get back? Yes, they have a chance. But this had the makings of a really special year and it had a great feel to it. Since I retired, this was the first time that I have seen a Cowboys team have the makings of being able to go all the way and they came up short. Your crew had a talent switch this year from Pam Oliver to Erin Andrews. Having worked with Pam as long as you did, was that any kind of an adjustment for you? It was not an adjustment whatsoever on Sundays. Erin has fit right in to our crew and she has been outstanding. She works hard at her job and has great relationships with people within the organizations. The biggest adjustment for me is Pam and I are extremely close, really, really close. I love her to death. She is like a sister to me. So I miss the conversations, her friendship and seeing her each week. I miss the talks she and I would have. They were not football talks. Whenever I had a crisis or just wanted a women’s perspective, she was the one I would go to. She is a special person in my life and I just miss the opportunity this year to see her on a weekly basis. She was very close with Jethro Pugh [who died last week at 70]. Whenever she came through Dallas, she and her husband would get with Jethro and that family. I think that was pretty tough on her. There's something I've always wanted to ask you, and people who read this column know very well how I feel professionally about Skip Bayless. In a book on the Cowboys in the 1990s, Bayless had a unsubstantiated claim that you were gay. Over the years you have generally not responded to this but I did read in the Dallas Morning News a couple of years ago that you said, and I quote: “I've not physically seen Skip Bayless since that time. That was in '95. And I still kind of wonder what I might do to him when I do see him.” How much anger today do you feel about what was written in that book? I’m upset about it because it was made up and there was nothing accurate about anything that was insinuated. And he did it, as he does everything, just for attention. I am probably more upset because I probably should have responded to it at the time it was going on. The advice to me was “Hey, just don’t address it. It’s not worth it. It doesn’t make any sense. It’s ridiculous. All it’s going to do is have people continue to talk about his book.” So I didn’t. But I probably could have responded differently and maybe that would have changed things. Maybe it wouldn’t have. But it is ridiculous, and, yeah, it bothers me. If that is a lifestyle people choose, so be it. It doesn't affect me one way or another. But it is not my lifestyle. Is there one game that you consider your best sports broadcasting performance? There is usually two or three broadcasts a year that I come out feeling really, really good about. The game was great, we were really good, it was lively, and we had great conversation. Not that everyone agrees with that [laughs] but that’s how we [Buck and Aikman] assess it or how I assess what I did. But I will say I have never come out of a broadcast and didn’t look back and think I wish I had said something a little differently or pointed something else out. And I was like that as a player. I tend to think I will never have the perfect broadcast but when I am done I do think I will look back at one or two and say this was about as good as it got for me. 1. ESPN’s coverage of Ohio State’s 42-20 victory over Oregon in the college football national championship drew 33.395 million viewers and an 18.2 U.S. household rating, the most-watched and highest rating in cable television history. When you include the numbers from the Megacast (ESPN2, ESPNU, ESPN Deportes and ESPNEWS), the overall viewership was 34,148,000 viewers. 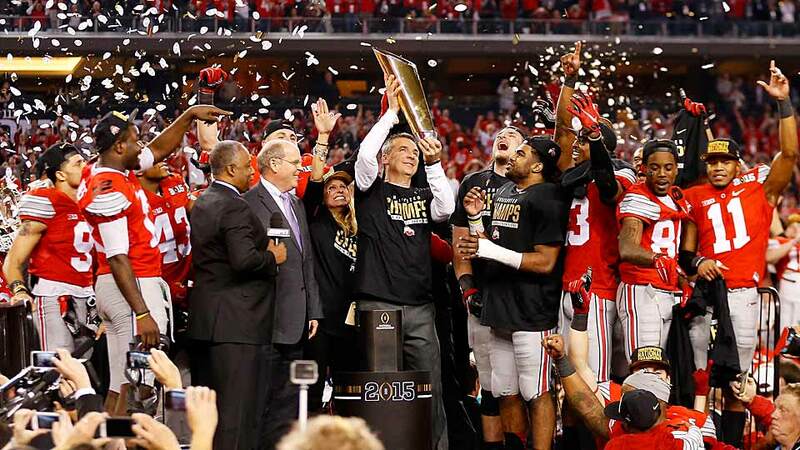 The network said the playoff semifinals and national championship telecasts combined to average 29,812,000 viewers. 1a. What cities delivered the best rating for Oregon-Ohio State? Columbus was the top overall market with a 51.2 local rating. The rest of the Top 10 was as followed: 2. Dayton; 3. Cleveland; 4. Portland; 5. Birmingham; 6. Cincinnati; 7. Jacksonville; 8. Knoxville; 9. Greenville; 10. Atlanta. 1b. ESPN said the title game set overnight postseason college football records in 22 metered markets: Cincinnati, Cleveland, Columbus, Dallas, Dayton, Denver, Ft. Myers, Las Vegas, Los Angeles, Minneapolis, New York, Norfolk, Philadelphia, Portland, Raleigh-Durham, Richmond, Sacramento, Salt Lake City, San Antonio, San Francisco, Seattle and Washington, D.C.
1c. Here’s my television review of the coverage. 1d. WatchESPN attracted 1,161,000 unique viewers for the main telecast, an increase of 110 percent (553,000 unique viewers) over 2014. (It ranked as the best non-World Cup event ever on WatchESPN.) When you add the Megacast numbers on WatchESPN, the total increased to 1,406,000 unique viewers. 1e. ESPN said an estimated 62,900 listeners tuned in on average to the National Championship game on the ESPN Audio. 2. CBS’ top NFL broadcasting unit (play-by-play announcer Jim Nantz, analyst Phil Simms, reporter Tracy Wolfson, producer Lance Barrow and director Mike Arnold) will work their 30th NFL game this season when the Colts play at the Patriots on Sunday at 6:40 p.m. ET. The network said the figure is the most games worked in one season by one broadcast crew in NFL history. The breakdown of games: 14 Thursday Night games, 11 Sunday afternoon games, three playoff games, one Thanksgiving Day game and one preseason game. 2a. The NFL said an average of 37.8 million viewers watched the four Divisional Playoff games last weekend, making it the most-watched NFL Divisional Weekend ever. The previous record was 2011 (36.6 million). The most-watched game was Fox’s telecast of Packers-Cowboys (44.4 million viewers). The Colts-Broncos game drew 41.8 million viewers on CBS, the second most-watched AFC divisional playoff game ever behind the Jets-Patriots in 2011. 3. Charles Barkley and Ronda Rousey have been added to the South By Southwest sports program. Barkley will head up a session titled "How To Remain Relevant In A Digital Age." 3a. ESPN’s Outside the Lines will air what it is calling “Content of Character” roundtable discussion with the executive directors of the players' unions for the NBA, NFL and MLB on Sunday at 9 a.m. ET on ESPNEWS and 10 a.m. on ESPN2. 4. Showtime will air a documentary on Kobe Bryant entitled Kobe Bryant’s Muse on Feb. 21 at 9 p.m. ET. Here’s a clip. 5. Tennis in America lives: ESPN’s Australian Open coverage begins Sunday at 7 p.m. ET on ESPN2. The network said it will air 100 live hours on television and nearly 800 more on ESPN3, where fans can choose from action on up to 13 courts. The full schedule is here.